PM Modi said that people sitting in AC rooms wouldn't know the ground reality of things. 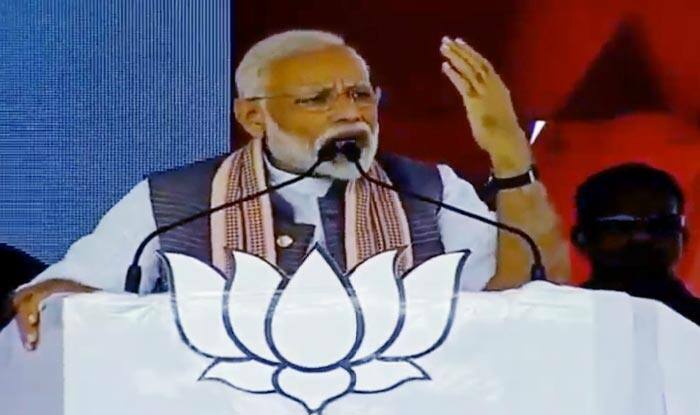 Madha: Prime Minister Narendra Modi while addressing a rally in Maharashtra’s Madha on Wednesday mocked Nationalist Congress Party (NCP) leader Sharad Pawar saying the reason behind the latter not fighting Lok Sabha elections was him being afraid of the saffron wave in the country. “Those sitting in Delhi in AC rooms and keeping a tab on things which will happen after who hugs whom, after who shakes hands with whom, after who looks at whom, they don’t know the ground reality. Now I know why Sharad Pawar ran away from the battleground,” said Modi. It was interesting to note that while Modi attacked NCP leader Pawar, party MP Vijaysinh Mohite Patil shared the stage with the PM at his poll rally in the district. As part of poll campaigning, PM Modi promised expansion of ‘PM Kisan Scheme’ when voted to power after May 23. He said he has even directed officials to provide immediate relief to people after unseasonal rains. He expressed condolences for the families which suffered losses due to the unseasonal rains in Gujarat, Rajasthan and Madhya Pradesh and Maharashtra. He said that he had asked authorities to continue close monitoring of the situation in these areas.